See also Ariadne ; Daedalus ; Greek Mythology ; Minos ; Monsters ; Theseus . A monstrous creature in Greek mythology, the Minotaur had the head of a bull and the body of a man. This vase painting dating from the 500s B . 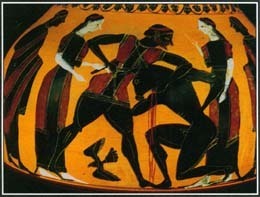 C . shows Theseus killing the Minotaur.